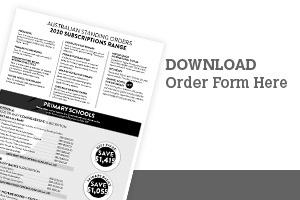 Please contact me with further information about Primary Standing Orders. Please enrol our school to receive each Primary Picture Books Standing Order on a sale-or-return basis. Please enrol our school to receive each Primary Fiction Standing Order on a sale-or-return basis. Please enrol our school to receive each Primary Nonfiction Standing Order on a sale-or-return basis.